In case of an emergency, please contact us immediately. Using natural gas is a safe and economical option for cooking and heating your water and home. There are many trustworthy appliances on the market today that if installed by a licensed gas fitter will operate efficiently and require relatively low maintenance for years to come. While having gas in your home is harmless for your family and pets day-to-day, do you know what you should do if you start smelling gas? Natural gas is actually tasteless and odourless. The "rotten egg" smell that can accompany natural gas is an additive called mercaptan. This is intentionally added so that people may be able to smell a gas leak. Teach your children to recognise the smell so they may alert you in the event something goes wrong. Tip: If you really want to be safe, you can buy a home natural gas detector. There are a number of companies that sell gas detectors. Turn off your metered gas supply. To do this turn the valve handle to Horizontal (so that it is level with the ground). It's important to make sure you know in advance where this valve is located at your gas meter. You may need a spanner to do this. If the smell is in the house and it is safe to do so, ventilate the area by opening windows and doors. If you see bushes or shrubs around the base of your home that have browned unusually quickly you may have a leak. If you smell gas and there are sparks or flames present. Leave immediately. If you hear gas "hissing" you potentially have a major leak. Go outdoors immediately. 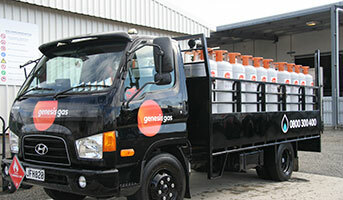 In all circumstances relating to natural gas it is better to be safe than sorry.